Learn more about the topic and the invited guest from here. Visit here for detailed information of the annual meeting. Visit here for detailed information of the 2014 annual meeting. Visit here for detailed information of the 2015 annual meeting. Learn more about the topic from here. Visit here for detailed information of the 2016 annual meeting. Visit here for detailed information of the 2017 annual meeting. Visit here for detailed information of the 2018 annual meeting. 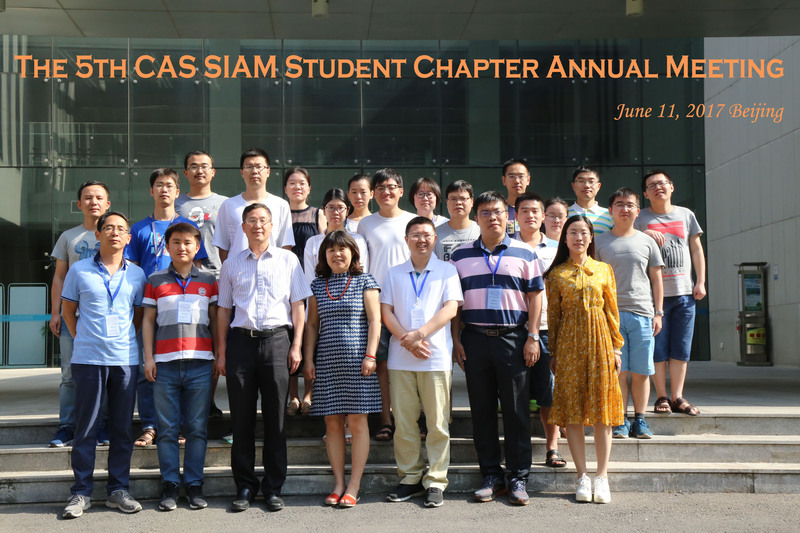 The 6th CAS SIAM Student Chapter Annual Meeting was held on June 24, 2018 at N204 Academy of Mathematics and Systems Science, Chinese Academy of Sciences, Beijing, China. The day consisted of an opening ceremony, five plenary talks and one contributed talk. The goal of the meeting was to bring together graduate students, young researchers and faculty to share their works, exchange ideas and promote potential cooperation. We were very honored to invite Prof. Qun Lin (AMSS, CAS), Prof. Yaxiang Yuan (AMSS, CAS) and Prof. Liqun Cao (AMSS, CAS)to attend our annual meeting. Prof. Qun Lin (AMSS, CAS), Prof. Yaxiang Yuan (AMSS, CAS) and Prof. Liqun Cao (AMSS, CAS) were invited as our distinguished guests to address the opening ceremony. Prof. Shihua Zhang (AMSS, Chinese Academy of Sciences, China), Prof. Tao Cui(Institute of Computational Mathematics, AMSS, Chinese Academy of Sciences, China), Prof. Ge Chen (AMSS, Chinese Academy of Sciences, China), Prof. Cong Sun (Beijing University of Posts and Telecommunications, China, Prof. Shifeng Xiong (Institute of Systems Science, AMSS, Chinese Academy of Sciences, China) and Prof. Chao Ding (Institutes of Applied Mathematics, AMSS, Chinese Academy of Sciences, China) were invited to give the plenary talks. 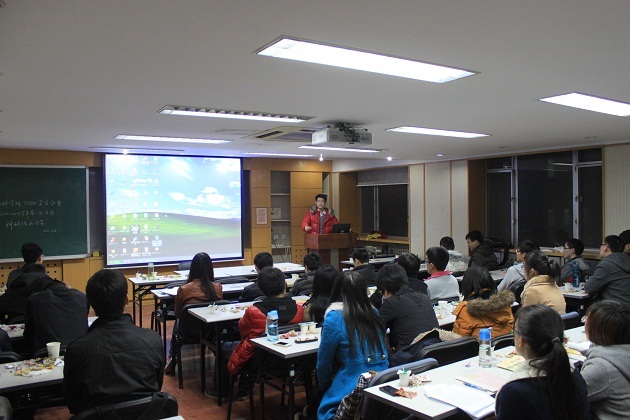 More than 50 students from mathematic institutes, universities attended the meeting. The 6th CAS SIAM Student Chapter Annual Meeting was sponsored by Institute of Computational Mathematics and Scientific/Engineering Computing (ICMSEC) and Society for Industrial and Applied Mathematics (SIAM). For more details, please refer to the homepage of our annual meeting. 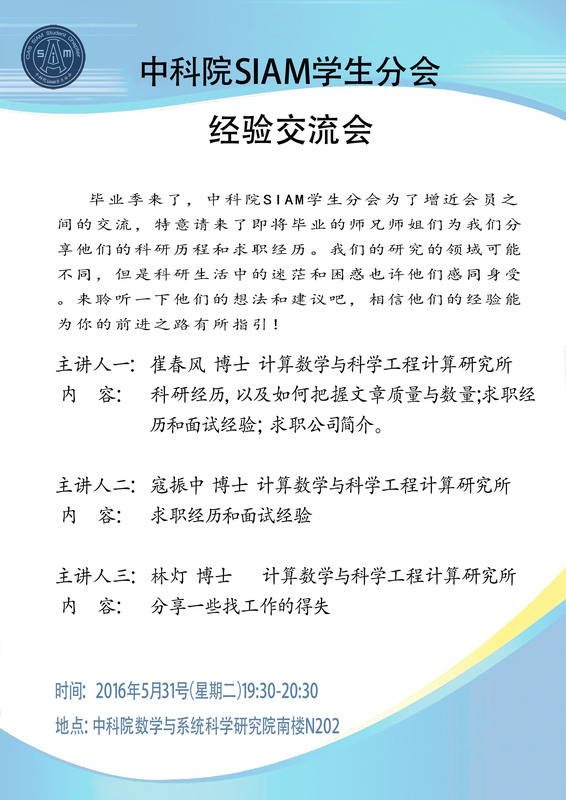 On May 9, 2018, Dr. Lingxiao Li, Dr. Shihao Li, Dr. Xuejiao Liu, Dr. Yufang Huang and Dr. Can Wang were invited to share their academic experience in Lecture of CAS SIAM Student Chapter. They would graduate this year. And there were twenty-six members of CAS SIAM Student Chapter who anticipated in this exchange activity. In their talk, they share how to overcome difficulties as a Ph.D. student, how to make choice and how to find a decent job. These topics are very attractive. Members are eager to ask questions about these topics. Questions include how to make a choice between academic career and business career, how to pass a job interview and how to fight for a good salary. The talk attracted many graduate students with various academic backgrounds, including those who are not the member of our chapter. After the talk, they had a hot discussion with the reporter. 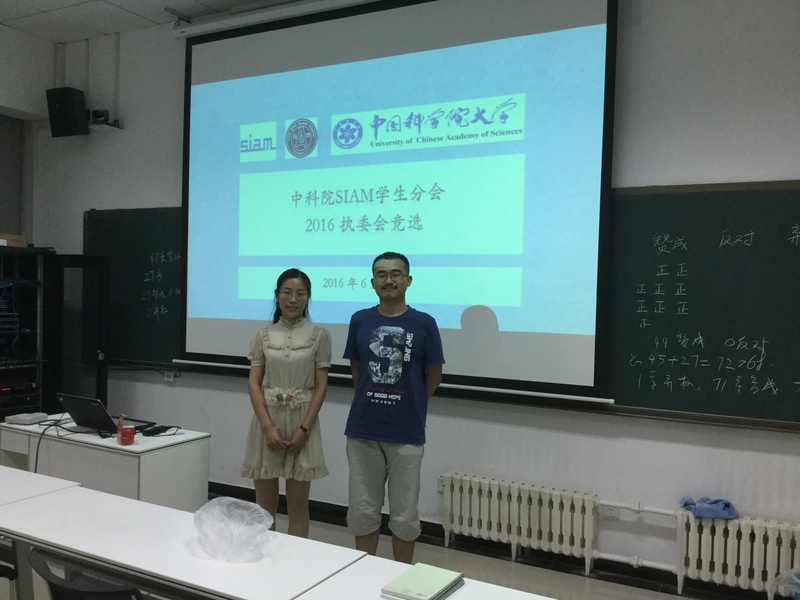 On April 25, 2018, M.Sc Jinzi Huang was invited to give us a lecture named "An overview of Chinese modern algebra" in Lecture of CAS SIAM Student Chapter. Currently, she is pursuing a M.S. degree in University of Chinese Academy of Sciences, China. In her talk, she mainly introduced overview of the history of Chinese modern algebra, including brief introductions of the tendency of development of algebra in the world, the development of Chinese algebra, lots of famous algebraists in modern China such as Jiong Zeng, Luogeng Hua, Zhao Ke, Huazong Li, Herui Zhang, etc. and the so much contributions about these great mathematicians. The talk attracted quite many graduate students who love math very much. 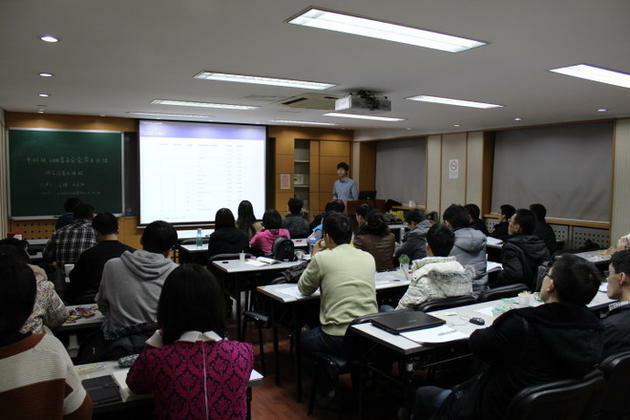 After the lecture, all exchange sufficiently their opinions about the topic. 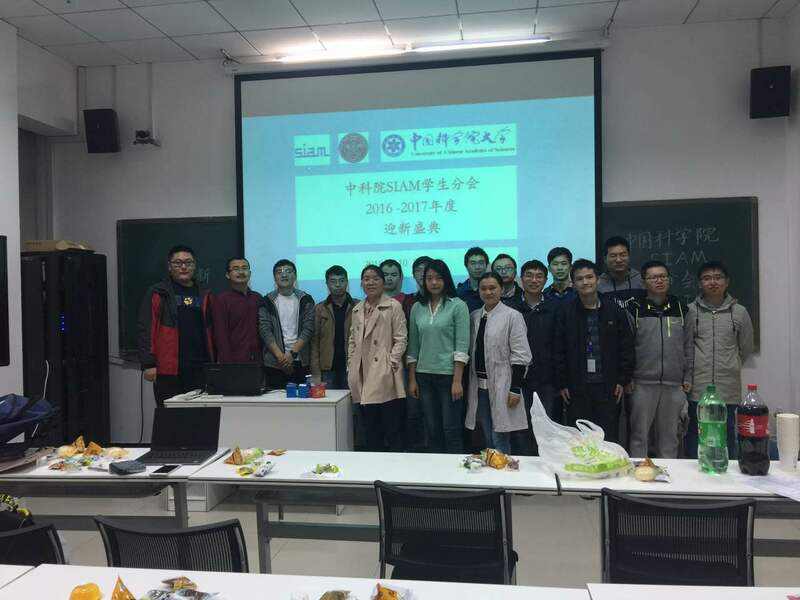 On December 16, 2017, Jin Qin was invited to give us a lecture named "Mathematical method in fingerprint recognition" in Lecture of CAS SIAM Student Chapter. Dr. Jin Qin received a degree of B.S. from Beijing University of Posts and Telecommunications in 2013. Currently, he is pursuing a Ph.D. degree in University of Chinese Academy of Sciences, China. His current research interests include image processing, machine learning and pattern recognition. In his talk, he mainly talks about overview of the fingerprint recognition development, focusing on mathematical model and mathematical method in this problem. According to his introduction,we know that the fingerprint recognition technology has become the hot spot because of its feasibility and reliability. Fingerprint identification is one of the most popular and reliable biometric techniques and it has been wildly applied to the authentication of individuals in many scenes such as electronic personal identification card, smart phone and so on. However, the vigorous development of fingerprint recognition technology makes many people have a wrong idea: it is already quite mature, the technical problems have been solved completely. While it is not true. 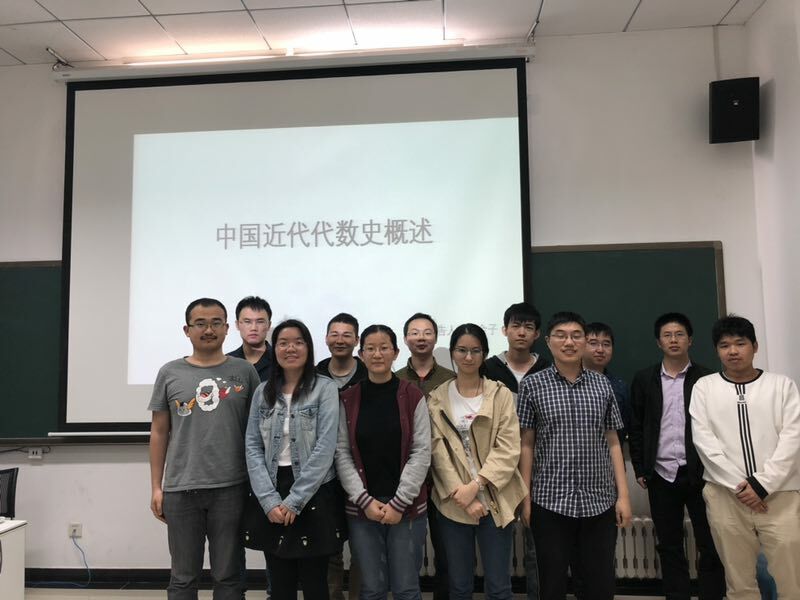 The talk attracted quite many graduate students with various academic backgrounds, especially those who major in optimization and are interested in fingerprint recognition. 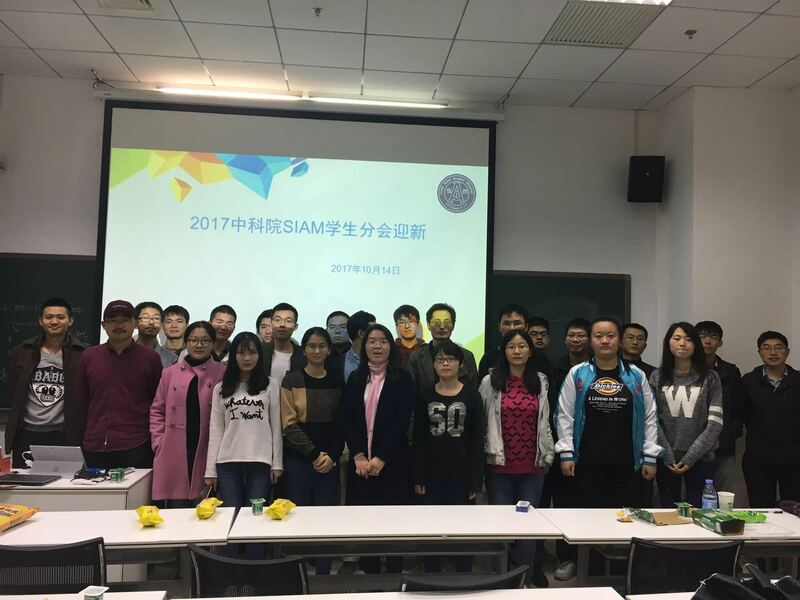 On November 18, 2017, M.Sc Zheng Xun was invited to give us a lecture named "Artificial intelligence typical algorithm and social applications research from the perspective of AlphaGo" in Lecture of CAS SIAM Student Chapter. First, he introduced the hot topic about the AlphaGo, called as artificial intelligence, who defeated the top human go master. It's a significant event in the history of development in the field of artificial intelligence and also makes more and more people realize the importance of artificial intelligence. Behind the AlphaGo, it is the algorithm, also called as deep learning or machine learning,that works by learning the parameters from already known data. 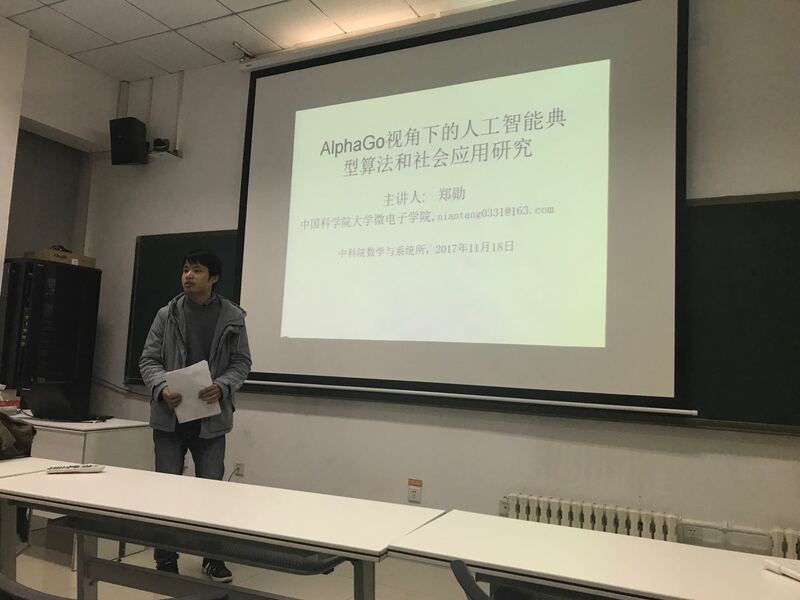 So M.Sc Zheng Xun talked about the algorithmic frame and principle of AlphaGo and put forward some questions about how to improve the performance and efficiency of algorithm, deep learning can be used in which areas of life, and so on. Then he introduced applications like speech recognition and fingerprint recognition about deep learning. At last part of the activity, all members of CAS SIAM Student Chapter exchanged their own opinions about the artificial intelligence. The CAS SIAM Student Chapter held a orientation meeting on October 14, 2017. Twenty-six members attended the meeting. The president Xiaoyu Wang gave a speech about the plan of activities of the Chapter with the new Executive Committee. First of all, Xiaoyu Wang gave a brief introduction to the Chapter and our Constitution. Then, she stated the rights and obligations of a student member of the Chapter. At last, she provided an introduction about our new plan of activities in detail, which includes seminars, annual meeting and meetings of exchange. After the speech, the Chapter issued some questionaires by QR code and collected their suggestions or opinions about the plan. The rest part of the meeting was free discussion. Each one of the members present introduced himself or herself one by one, including major, research field and recent work. After that, those who shared the similar interest got together and made a further discussion. Thus, several interst groups turned up and everyone got involved in the research communication. After the meeting, all participants had a group photo taken to celebrate the success of this meeting. The CAS SIAM Student Chapter held a election meeting on June 18, 2017. We obtained 52 legal votes which is more than 2/3 of the total number of members. There was only one candidate team with members: Xiaoyu Wang (president), Peng Wei (vice president), Meng Shi (Secretary) and Nachuan Xiao (treasurer). There were 51 affirmative votes for the team which is over 1/2 of the total votes. Meanwhile there were 0 dissenting votes and 1 vote abstentions. According to section 8 of ARTICLE VIII of our Rules of Procedure, this team was elected as the 7th Executive Committee. The term of the 7th Chapter officers is one year, and shall last from the beginning of the second week of academic year 2017 to the end of the first week of the academic year 2018. 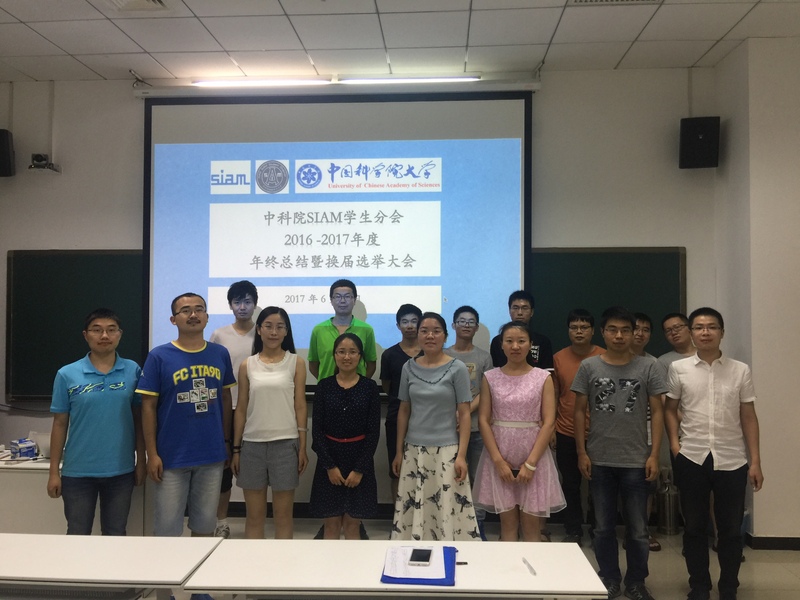 The 5th CAS SIAM Student Chapter Annual Meeting was held on June 11, 2017 at N204 Academy of Mathematics and Systems Science, Chinese Academy of Sciences, Beijing, China. The day consisted of an opening ceremony, five plenary talks and one contributed talk. We were very honored to invite Prof. Yaxiang Yuan (AMSS, CAS) and Prof. Guiying Yan (AMSS, CAS) to attend our annual meeting. Prof. Yaxiang Yuan (AMSS, CAS) and Prof. Guiying Yan (AMSS, CAS) were invited as our distinguished guests to address the opening ceremony. Prof. Hehu Xie (AMSS, Chinese Academy of Sciences), Prof. Yingjie Tian (CAS Research Center On Fictitious Economy & Data Science), Prof. Xingyu Gao (Institute of Applied Physics and Computational Mathematics), Prof. Yong Xia (Beihang University) and Prof. Xue Jiang (Beijing University of Posts and Telecommunications) were invited to give the plenary talks. More than 50 students from mathematic institutes, universities attended the meeting. The 5th CAS SIAM Student Chapter Annual Meeting was sponsored by Institute of Computational Mathematics and Scientific/Engineering Computing (ICMSEC) and Society for Industrial and Applied Mathematics (SIAM). 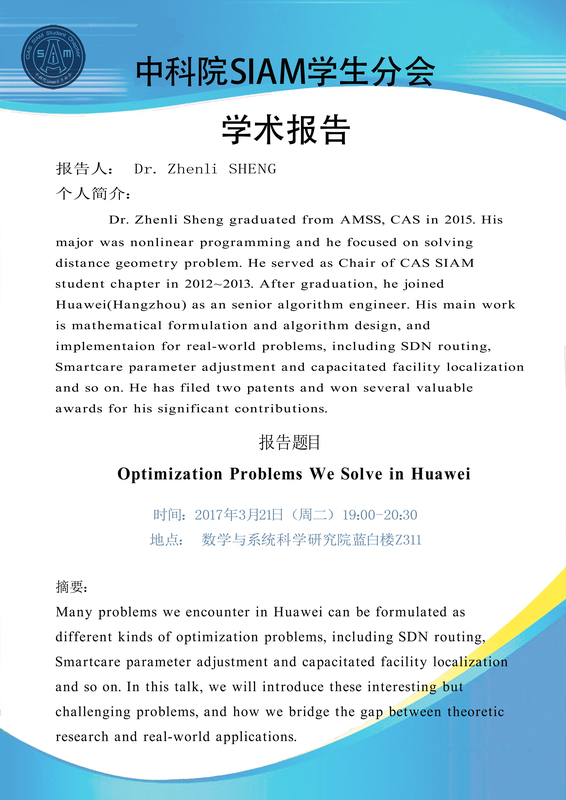 On March 21, 2017, Zhenli Sheng was invited to give us a lecture named "Optimization Problems We Solve in Huawei" in Lecture of CAS SIAM Student Chapter. Dr. Zhenli Sheng graduated from AMSS, CAS in 2015. His major was nonlinear programming and he focused on solving distance geometry problem. He served as Chair of CAS SIAM student chapter in 2012~2013. After graduation, he joined Huawei(Hangzhou) as an senior algorithm engineer. His main work is mathematical formulation and algorithm design and implementaion for real-world problems, including SDN routing, Smartcare parameter adjustment and capacitated facility localization and so on. He has filed two patents and won several valuable awards for his significant contributions. In his talk, he mainly talks about several different optimization algorithms currently used in Huawei. In the beginning, he gives some brief introdutions about research institution of Huawei all over China. Then, he converts the challenges in communication field to mathematical models. Next, he brings up two algorithms: Constraint Column Generation and Lagrangian Relaxation. Besides, he also mentions some interesting related problems of optimization when it comes to application, such as capacitated facility localisation and scheduling in cloud computing. Addtionally, he admits that there is still a long way to go to improve the behavior of the algorithms in convergency. 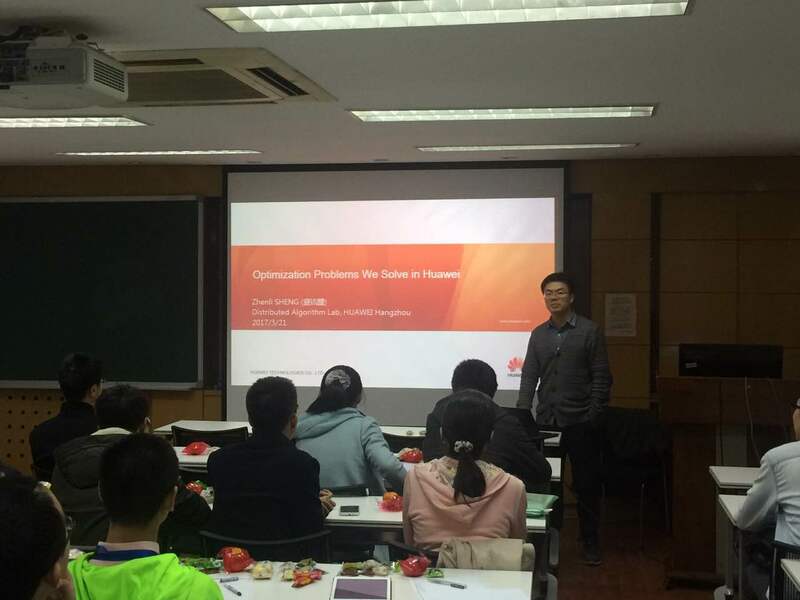 The talk attracted quite many graduate students with various academic backgrounds, especially those who major in optimization and are interested in Huawei. 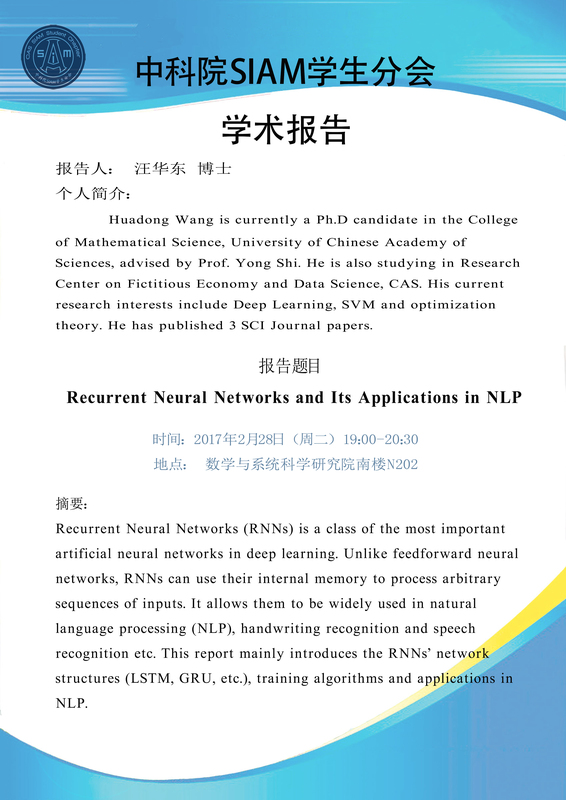 On February 28, 2017, Huadong Wang was invited to give us a lecture named "Recurrent Neural Networks and Its Applications in NLP" in Lecture of CAS SIAM Student Chapter. 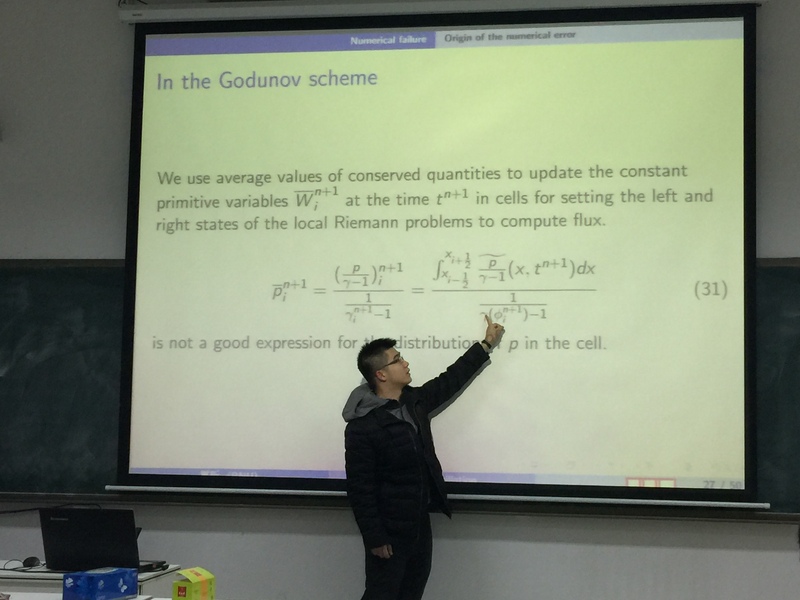 Huadong Wang is currently a Ph.D. candidate in the College of Mathematical Science, University of Chinese Academy of Sciences, advised by Prof. Yong Shi. He is also studying in Research Center on Fictitious Economy and Data Science, CAS. His current research interests include Deep Learning, SVM and optimization theory. He has published 3 SCI Journal papers. In his talk, he divides the whole talk into two parts: introduction to recurrent neural network and applications in NLP. In the first part, he compares recurrent network with multi-layer perceptron. Then, he shows the challenge of long-term dependencies. Next, he finishes this part by mentioning Long Short Memory Network model. In the second part, he illustrates some applications in natural language processing, handwritting recognition and speech recongnition in detail. Addtionally, he recommends recent focuses of this field. 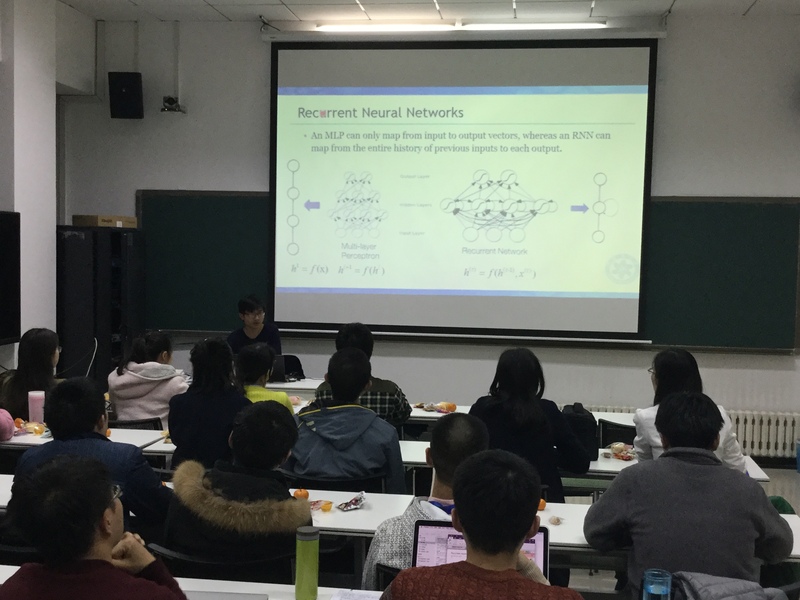 The talk attracted quite many graduate students with various academic backgrounds, especially those who major in the research field of neural networks. After the talk, they took a photo with the lecturer as a souvenir. 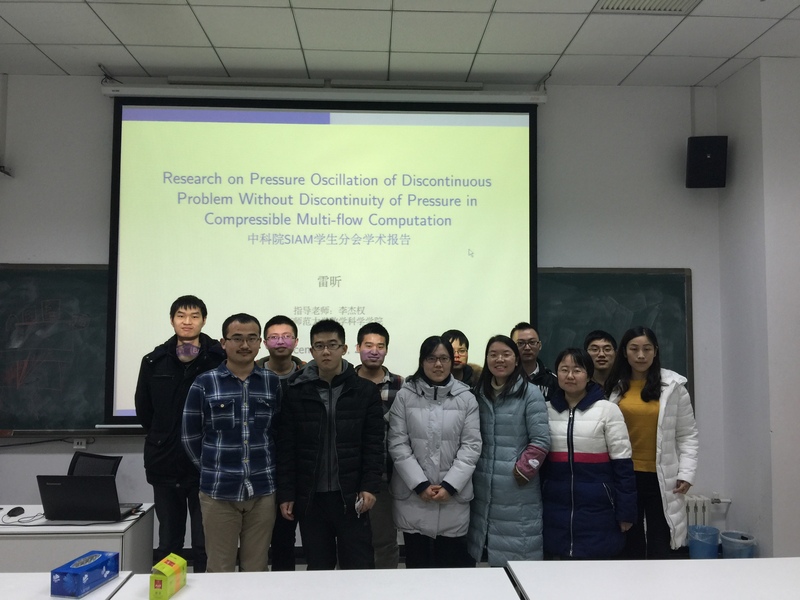 On December 24, 2016, Xin Lei was invited to give us a talk named "Research on Pressure Oscillation of Discontinuous Problem without Discontinuity of Pressure in Compressible Multi-flow Computation" in Lecture of CAS SIAM Student Chapter. Xin Lei is currently a Ph.D. student under the direction of Professor Jiequan Li in Beijing Normal University. His research direction is computational mathematics, and his main research interest includes numerical schemes in fluid computation. What's more, he would like to share his ideas in that research direction. In his talk, he focuses on how to eliminate oscillations generated at material interfaces in numerical schemes. Firstly, he introduces some physical backgrounds of the fluid computation, and displays that oscillations do occur in ordinary schemes. Then he presents a kind of correction arithmetic for Godunov method which is able to prevent the oscillations of pressure as well as not to interfer computation of other physical variables in one dimensional spatial space. Besides, he generates it into two dimensional spatial space. In addition, he discusses how to deal with the arithmetic when it comes to unstructed grid. The talk attracted many graduate students with various academic backgrounds, including two who are not the member of our chapter from other academies. After the talk, they had a hot discussion with the lecturer. The CAS SIAM Student Chapter held a orientation meeting on October 10, 2016. Seventeen members attended the meeting. 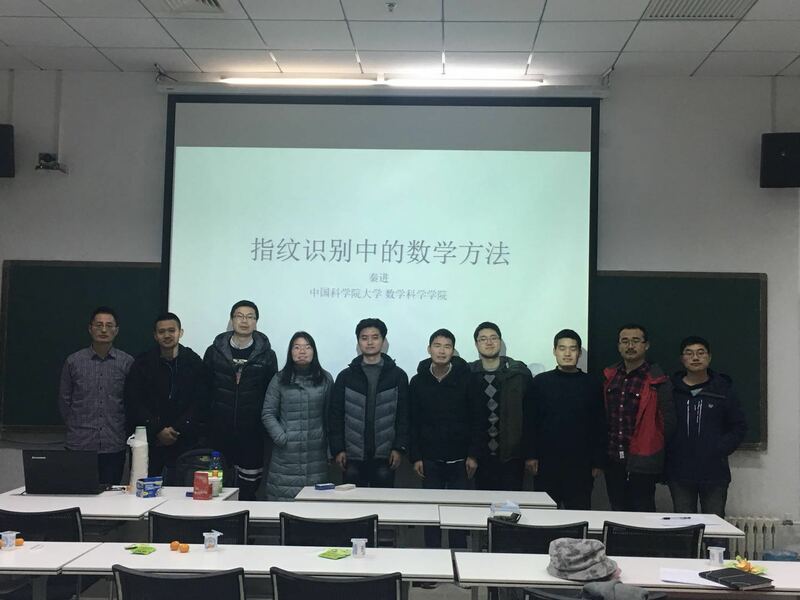 The vice president Qiao Wang on behalf of the president Dandan Chen gave a speech about the plan of activities of the Chapter with the new Executive Committee. First of all, Qiao Wang gave a brief introduction to the Chapter and our Constitution. Then, he stated the rights and obligations of a student memeber of the Chapter. At last, he provided an introduction about our new plan of activities in detail, which includes seminars, annual meeting and meetings of exchange. After the speech, the Chapter issued some questionaires by QR code and collected their suggestions or opinions about the plan. The CAS SIAM Student Chapter held a election meeting on June 20, 2016. We obtained 72 legal votes which is more than 2/3 of the total number of members. There was only one candidate team with members: Dandan Chen (president), Qiao Wang (vice president), Xiaoyu Wang (Secretary) and Donghang Zhang (treasurer). There were 71 affirmative votes for the team which is over 1/2 of the total votes. Meanwhile there were 0 dissenting votes and 1 vote abstentions. According to section 8 of ARTICLE VIII of our Rules of Procedure, this team was elected as the 6th Executive Committee. The term of the 6th Chapter officers is one year, and shall last from the beginning of the second week of academic year 2016 to the end of the first week of the academic year 2017. 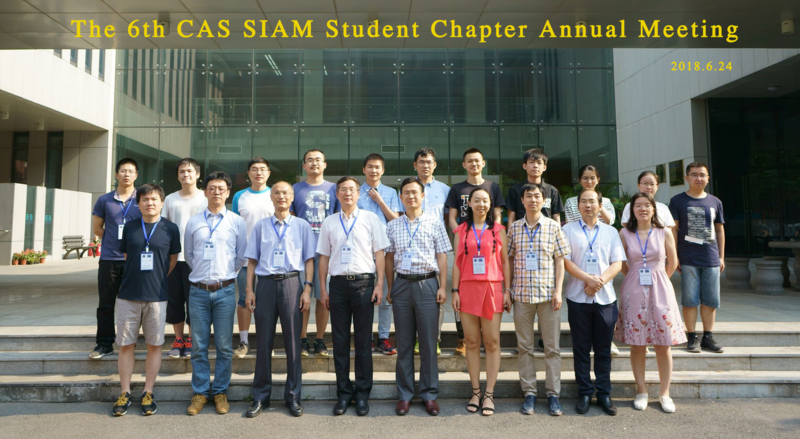 The 4th CAS SIAM Student Chapter Annual Meeting was held on June 5, 2016 at N204 Academy of Mathematics and Systems Science, Chinese Academy of Sciences, Beijing, China. The day consisted of an opening ceremony, four plenary talks and two contributed talks. We were very honored to invite Prof. Qun Lin (AMSS, CAS), Prof. Yaxiang Yuan (AMSS, CAS) and Prof. Aihui Zhou (AMSS, CAS) to attend our annual meeting. Prof. Yaxiang Yuan (AMSS, CAS) and Prof. Aihui Zhou (AMSS, CAS) were invited as our distinguished guests to address the opening ceremony. Prof. Yanfei Wang (Institute of Geology and Geophysics, CAS), Prof. Xiaowen Xu (Institute of Applied Physics and Computional Mathematics), Prof. ZhiQiang Xu (AMSS, CAS) and Prof. Weiying Zheng (AMSS, CAS) were invited to give the plenary talks. 50 students from mathematic institutes, universities attended the meeting. The 4th CAS SIAM Student Chapter Annual Meeting was sponsored by Institute of Computational Mathematics and Scientific/Engineering Computing (ICMSEC) and Society for Industrial and Applied Mathematics (SIAM). 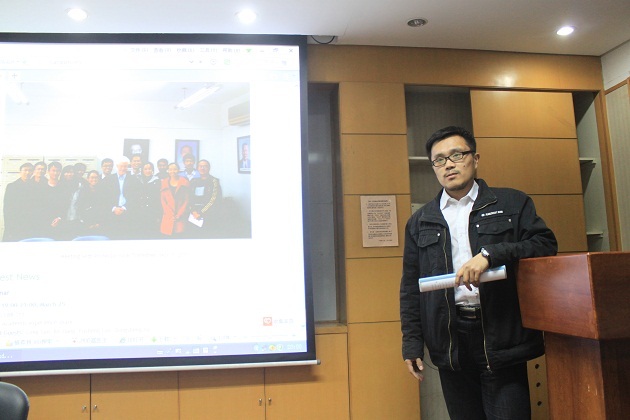 On May 31, 2016, Dr. Chunfeng Cui, Dr. Zhenzhong Kou and Dr. Deng Lin were invited to share their academic experience in Lecture of CAS SIAM Student Chapter. They all passed Ph.D. thesis reply several days ago. Dr. Cui's research interest is in the calculation of eigenvalues of symmetric tensor. Dr. Kou is interested in CFD. And Dr. Lin is interested in large-scale parallel programming. Currently, they all have received offers from HUAWEI which is one of the most famous companies in China. In their talk, they share how to overcome difficulties as a Ph.D. student, how to make choice and how to find a decent job. These topics are very attractive. There are at least 60 students attending the meeting. Members are eager to ask questiones about these topics. Questiones include how to make a choice between academic career and business career, how to pass a job interview and how to fight for a good salary. On April 23, 2016, the CAS SIAM Student Chapter held a exchange meeting at Huirou. This meeting aimed to introduce SIAM and the CAS SIAM Chapter to members who are learning fundamental knowledge in Huirou. The president Lingxiao Li gave a speech. 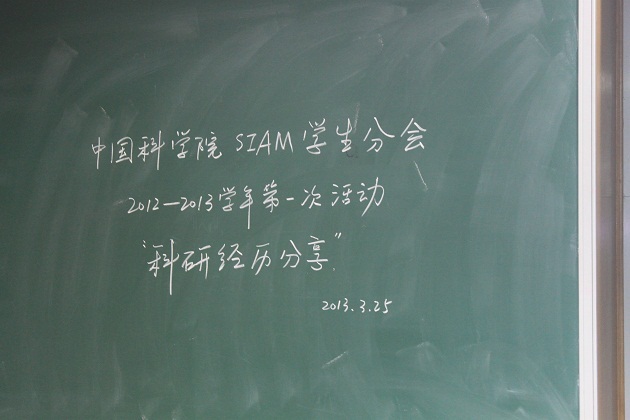 In this talk, President Li states the mission of SIAM. Then, He explains the privilege to be a SIAM member and distinguishes the differences of SIAM membership and SIAM Student membership. After that, He gives a brief description about the process of the construction of CAS SIAM Student Chapter. Finally, He introduces the mission and Constitution of CAS SIAM Student Chapter. After this meeting, some members who want to be a new member of Executive Committee had a hot discussion with President Li. We appreciate Xiaoyu Wang who arranged this meeting. 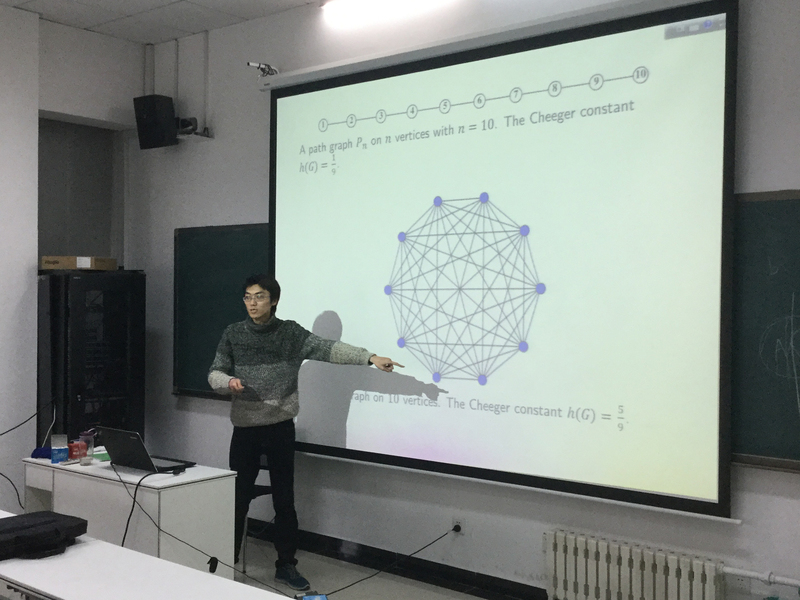 On April 19, 2016, Dong Zhang was invited to give us a talk named "The $1$-Laplacian Cheeger Cut: Theory and Algorithms" in Lecture of CAS SIAM Student Chapter. Dong Zhang is currently a Ph.D. student under the direction of Professor Kung-Ching Chang in Peking University. His research direction is nonlinear analysis, and his main research interest includes the theory of graph 1-Laplacian and Cheeger cut and the prescribed mean curvature equation. What's more, he has made a breakthrough in that research direction. In his talk, he focuses on both theory and algorithms for the Cheeger cut based on the graph 1-Laplacian. The Cheeger cut theory can give a good approach to classify users of social network, which keeps some targets of different classes to be balance. In virtue of the cell structure of the feasible set, he proposes a cell descend framework for achieving the Cheeger cut. As for this framework, he designs two specified cell descend methods by plugging the relaxation to guarantee the decrease of the objective value in the feasible set, from which both the inverse power method and the steepest descent method can also be recovered. 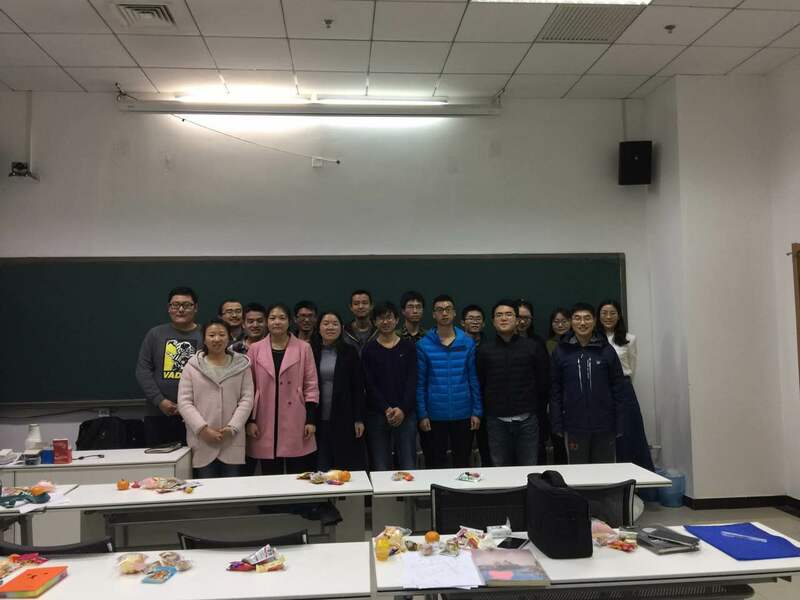 On December 24, 2015, Vice-Professor Tao Cui was invited to give us a talk named "The Development of 3D VLSI Interconnect Parasitic Extraction Tool" in Lecture of CAS SIAM Student Chapter. He used to be a PHD student of the Institute of Computational Mathematics and Scientific/Engineering Computing, and he is one of the developers of PHG which is a general parallel finite element software platform. Now, he is a Vice-Professor of AMSS. In his talk, he narrates the process of how to code the ParAFEMImp which was developed to solve the wideband impedence extraction problems. Then he uses much of time to reply the questions which were proposed by some members of our Student Chapter a week ago, including C/Fortran mixed programming, code optimization. he also recommends several useful books about code designing and shares many practical techniques associated with programming. Moreover, he uses his PC to show how to solve previous problems. 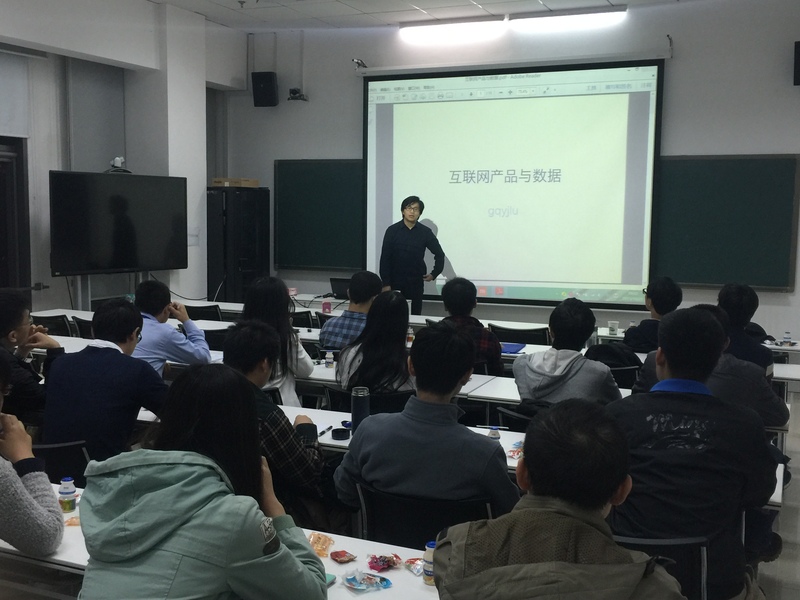 On October 23, 2015, Qianyuan Guang was invited to give us a talk named "Mathematics Applied in the Internet and Entrepreneurial Experience Sharing" in Lecture of CAS SIAM Student Chapter. He used to be a PM of Renren and Sougou internet companies, which makes him become a experienced and successful person. Now he is one of founders and a PM of internet company Haoyayi. In his talk, he introduces how a internet company makes a lot of money through advertisements. He emphasizes that ideas and interest about somethig are very important for our life. He also presents some mathmatics equations in domain of internet. In recent deacades, internet techniques have changed our life. It enhances the communication between different people and speeds up the development of economy. In that case, he thinks that we can easily make big influences on people by internet. He also states the importance of mathematical thinking in internet techeniques. 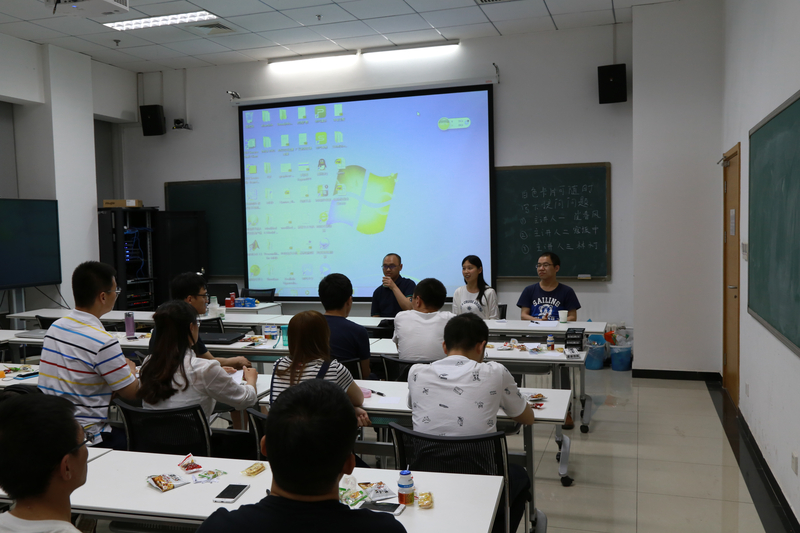 The CAS SIAM Student Chapter held a orientation meeting on September 24, 2015. Twenty members including several former officers of the Chapter attended the meeting. The president Lingxiao Li give a speech about the activities plan of the Chapter during the iterm of the new Executive Committee. 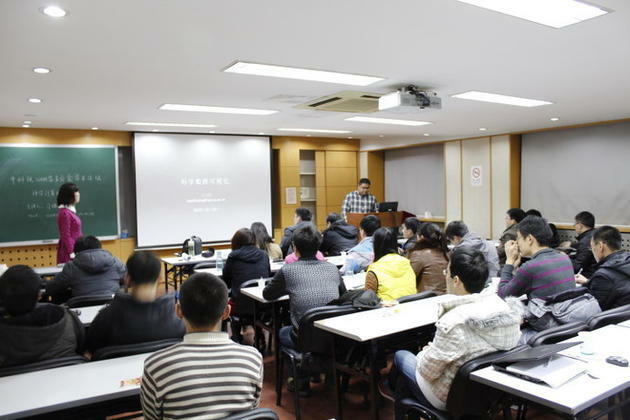 First of all, Lingxiao Li stated the profits of a student memeber of the Chapter. Then, he gave a simply introduction to the Chapter and our Constitution. At last, he provided a detailed introduction about our new activities plan. That includes seminars, annual meeting and meetings of exchange. During the meeting, the Chapter issued some questionaires and collected their suggestiones or opinions about the plan. The CAS SIAM Student Chapter held a election meeting on June 24, 2015. We obtained 65 legal votes which is more than 2/3 of the total number of members. There was only one candidate team with members: Lingxiao Li (president), Shaoliang Hu (vice president), Lina Zhang (Secretary) and Bin Gao (treasurer). There were 54 affirmative votes for the team which is over 1/2 of the total votes. Meanwhile there were 4 dissenting votes and 7 vote abstentions. According to section 8 of ARTICLE VIII of our Rules of Procedure, this team was elected as the 5th Executive Committee. The term of the 5th Chapter officers is one year, and shall last from the beginning of the second week of academic year 2015 to the end of the first week of the academic year 2016. 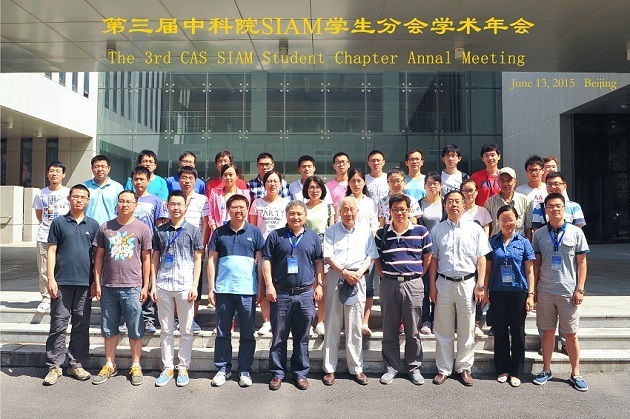 The 3rd CAS SIAM Student Chapter Annual Meeting was held on June 13, 2015 at N204 Academy of Mathematics and Systems Science, Chinese Academy of Sciences, Beijing, China. The day consisted of an opening ceremony, three plenary talks and five contributed talks. We were very honored to invite Prof. Qun Lin (AMSS, CAS), Prof. Yaxiang Yuan (AMSS, CAS) and Prof. Aihui Zhou (AMSS, CAS) to attend our annual meeting. Prof. Yaxiang Yuan (AMSS, CAS) and Prof. Aihui Zhou (AMSS, CAS) were invited as our distinguished guests to address the opening ceremony. Prof. Song Jiang (Institute of Applied Physics and Computional Mathematics), Prof. Ruo Li (Peking University) and Associate Prof. HeHu Xie (AMSS, CAS) were invited to give the plenary talks. 52 students from mathematic institutes, universities attended the meeting. The 3rd CAS SIAM Student Chapter Annual Meeting was sponsored by Institute of Computational Mathematics and Scientific/Engineering Computing (ICMSEC) and Society of Industrial and Applied Mathematics (SIAM). 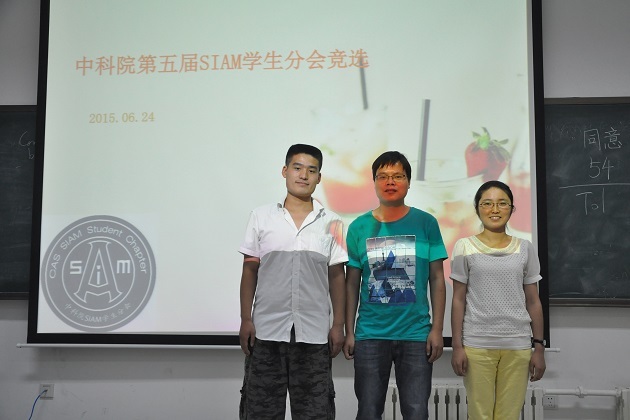 On May 29, 2015, Xiao Wang was invited to give us a talk named "Stochastic Quasi-Newton Methods for Nonconvex Stochastic Optimization" in Lecture of CAS SIAM Student Chapter. She used to be a PHD student of Institute of Computational Mathematics and Scientific/Engineering Computing, and now she is a teacher in University of Chinese Academy of Sciences (UCAS). In her talk, she gives us a brief introduction to the development of Stochastic Optimization. She presents a general framework of stochastic quasi-Newton methods for solving nonconvex stochastic optimization which extends the classic quasi-Newton methods working in deterministic settings to stochastic settings and a general framework for a class of randomized stochastic quasi-Newton methods. She also presents stochastic damped-BFGS method and stochastic cyclic Barzilai-Borwein method which are the specific of the randomized stochastic quasi-Newton methods. The complexities of these methods are analyzed and there are some numerical results to demonstrate the efficiency of the proposed methods. On Apr. 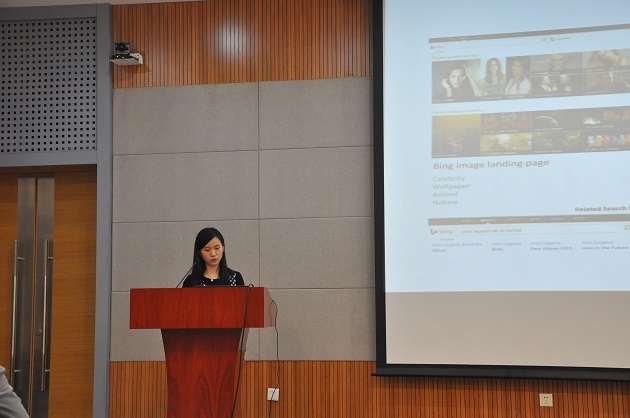 1, 2015, Yan Xie was invited to give us a talk named "Introduction of Bing Related Search: Product, Algorithms and Infrastructure" in Lecture of CAS SIAM Student Chapter. She used to be a PHD student of Institute of Computational Mathematics and Scientific/Engineering Computing, and now works in Microsoft Search Technology Center. In her talk, she gives us a brief introduction to Bing Related Search which contributes most DSQ and helps users explore more interesting queries. She also talks about the three important parts of the Related Search: the product part provides us many interesting cases selected from different user groups; the algorithm part introduces the framework of entire ranking pipeline and the LambdaRank/Logistic Regression model; the infrastructure part is about the online/offline metrics. On Dec. 22, 2014, Jinglin Li was invited to give us a talk named "Application of the pseudo spectral method in the missile trajectory optimization designs" in Lecture of CAS SIAM Student Chapter. She is a PHD student of School of Astronautics, Beihang University. In her talk, she gave us a brief introduction of trajectory optimization designs which were very important in the aircraft designs such as the missile designs. These problems can be modeled as linear or nonlinear optimal control problems with ODEs or PDEs constraints. She showed us how to use the pseudo spectral method to solve these problems and she also showed us the efficiency and the higher accuracy of this method when it was used to solve these problems. The talk attracted many graduate students with various academic backgrounds, including those who are not the member of our chapter. They had hot discussions after her talk. 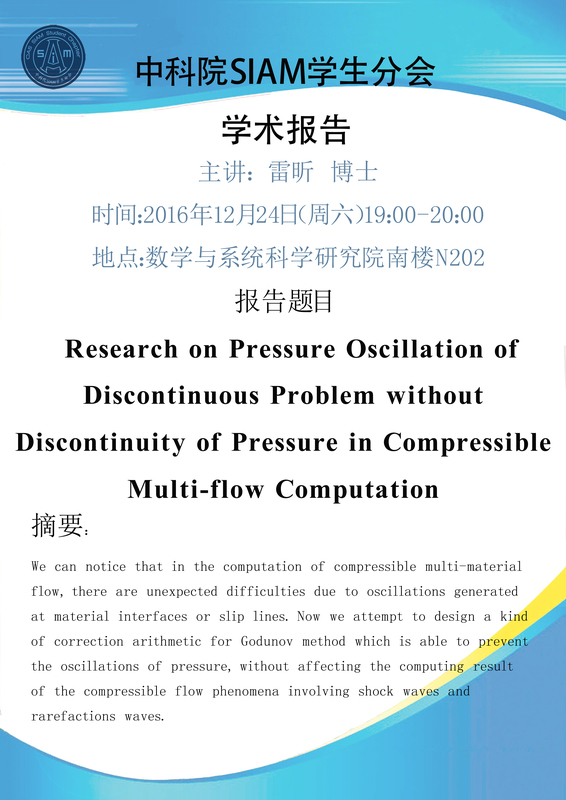 On Nov. 24, 2014, Kaibo Hu was invited to give us a talk about "Finite element exterior calculus and the structure-preserving discretization of MHD systems" in Lecture of CAS SIAM Student Chapter. He is a PHD student of Beijing international center for mathematical research, Peking university. In his talk, he introduced the concept of finite element exterior calculus which is widely used in the computation and the finite element construction of the electromagnetic field and elastic mechanics. He also showed us the well-posedness and convergence of the linearized numerical scheme and the existence of the solution of nonlinear discrete problem using the Brezzi theory. The talk attracted several professors and more than forty graduate students with various academic backgrounds. The CAS SIAM Student Chapter held a election meeting on June 24, 2014. 42 members attended the meeting and voted. Thus, we obtained 42 legal votes which is more than 2/3 of the total number of members. There were 42 votes for the group with members: Ran Gu (president), Beibei Zhu (vice president), Zhiyu Tan (Secretary) and Manting Xie (treasurer) which is over 1/2 of the total number of members. According to the constitution of our chapter, this group was elected as the 4th Executive Committee. The term of the 3rd Chapter officers is one year, and shall last from the beginning of the second week of academic year 2014 to the end of the first week of the academic year 2015. 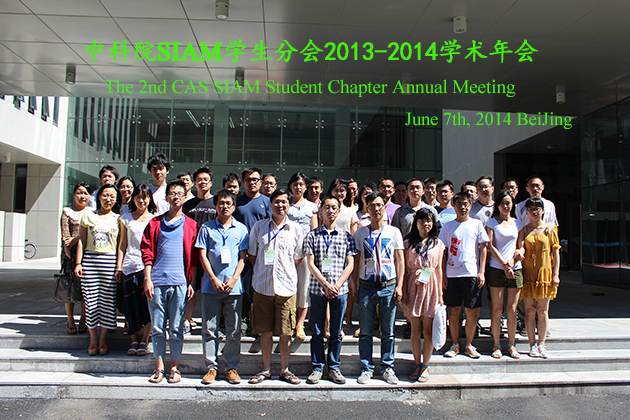 The 2nd CAS SIAM Student Chapter Annual Meeting was held on June 7, 2014 at N202 Academy of Mathematics and Systems Science, Chinese Academy of Sciences, Beijing, China. Professor Yaxiang Yuan, the faculty advisor, was invited to attend the opening ceremony. Two plenary talks and five contributed talks were presented during the whole day meeting. Over fifty participants from mathematic institutes, company, universities attended the meeting. 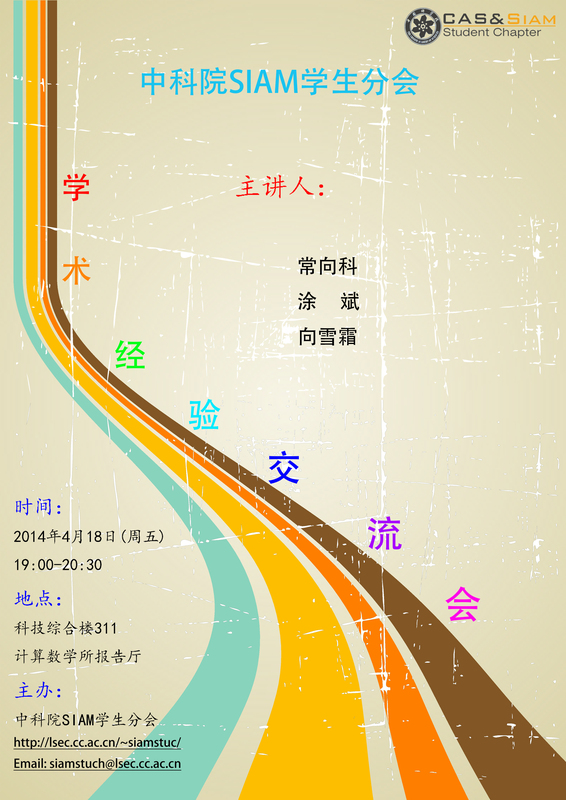 On April 18, 2014, we held 2013-2014 Academic Experience Communication Meeting. 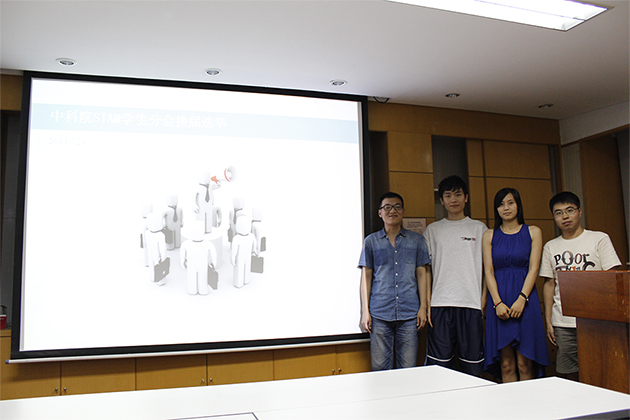 Xiangke Chang, Bin Tu, Xueshuang Xiang were invited to share their experience in research and finding jobs. 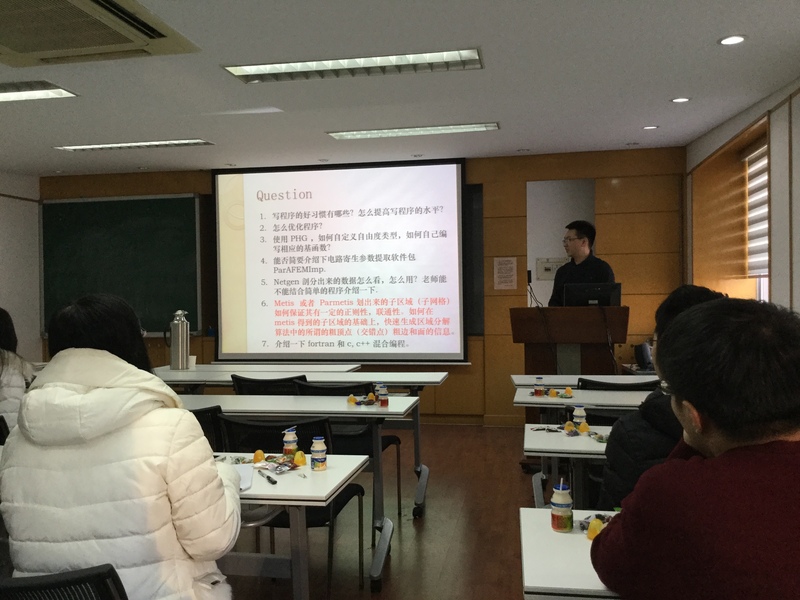 Xiangke Chang talked about his academic experience from starting the research direction, achieving the first article and accomplish many excellent works. Such academic road is changing from hope, disappointment to excitement and surprise. Bin Tu shared his experience in finding jobs. He suggested that one should figure out the exact goal and prepare for that in advance, which will benefit oneâ€™s career in the coming future. 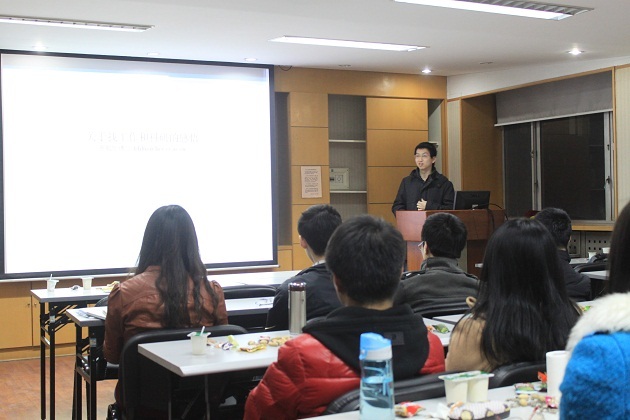 Xueshuang Xiang talked about his experience on academic research and job interviews. From the perspective of doning research, he stressed the importance of inspiration. For finding a favorite job, he gave us some advices and tips with vivid interview stories of his own. A workshop on scientific computing and programming is organized by CAS SIAM Student Chapter on December 26,2013. 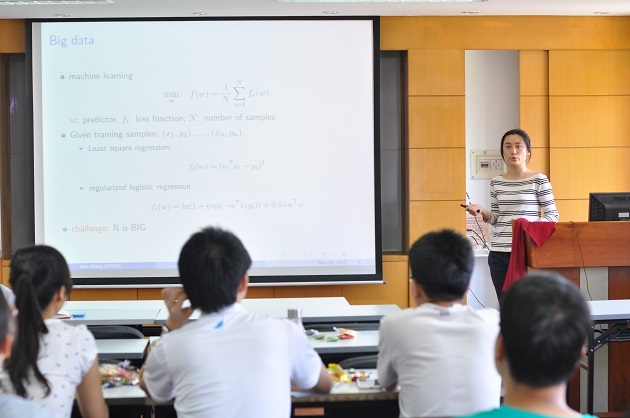 Two speakers, Rui Diao and Shiyang Bai from Chinese Academy of Sciences, were invited to give talks on scientific computing and data visualization. In this talk, some kinds of Compiled languages and Scripting Languages were introduced form the perspective of computing speed, memory usage and writing difficulty. 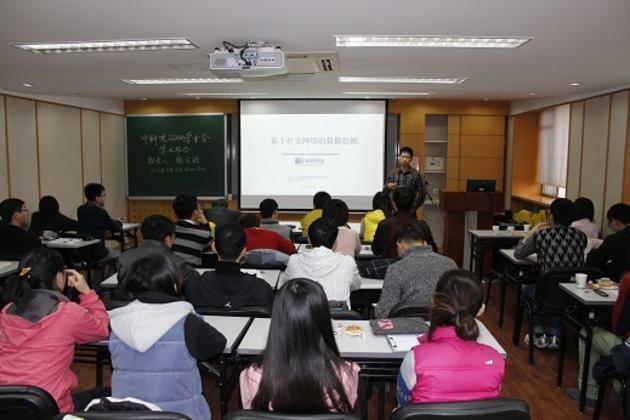 At the same time, the speaker discussed how to use these languages in scientific computing. In this talk, some fundamental techniques in data visualization were introduced. The visualization package VTK was discussed with some specific examples. At last, the speaker displayed the their own software VCMM developed by Python which provide a practical experience for participants. 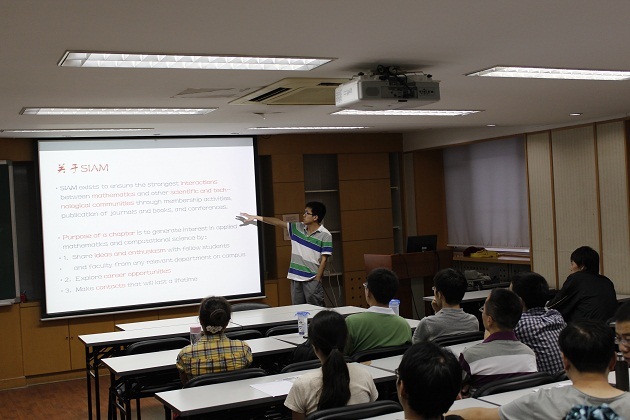 On Nov. 15, 2013, Wenhao Zhang was invited to give us a talk about "Data Mining in Social Media" in Lecture of CAS SIAM Student Chapter. He is the founder of Doodod Science and Technology Ltd, meanwhile a phD student at Department of Computer Science and Technology, Tsinghua University. In his talk, several data mining methods were discussed. 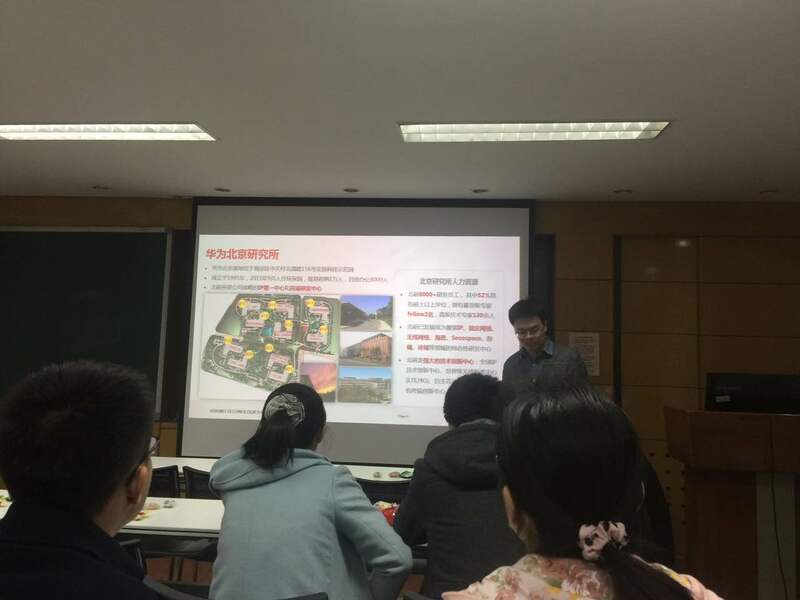 He presented some examples of Doodod Dissemination Analysis based on Weibo, including weather forecast, mobile phone sales forecast and a public welfare project they did for Ya'an earthquake. The talk attracted more than forty graduate students with various academic backgrounds, including those who are not the members of our chapter. On June 19, 2013, the CAS SIAM Student Chapter held an election meeting. 30 members attended the election meeting, and 10 others had authorized other member to vote on behalf of them. So we obtained 39 valid votes, which was more than 2/3 of the total members (53). 38 of them voted for Shuxiong Wang (president), Zhilong Dong (vice president), Tiantian Liu (secretary) and Zhenzhong Cou (treasurer), which was more than 1/2 of all the votes. So, according to section 8 of ARTICLE VIII of our Rules of Procedure, they were elected the 3rd Executive Committee. The term of the 3rd Chapter officers is one year, and shall last from the beginning of the second week of academic year 2013 to the end of the first week of the academic year 2014. 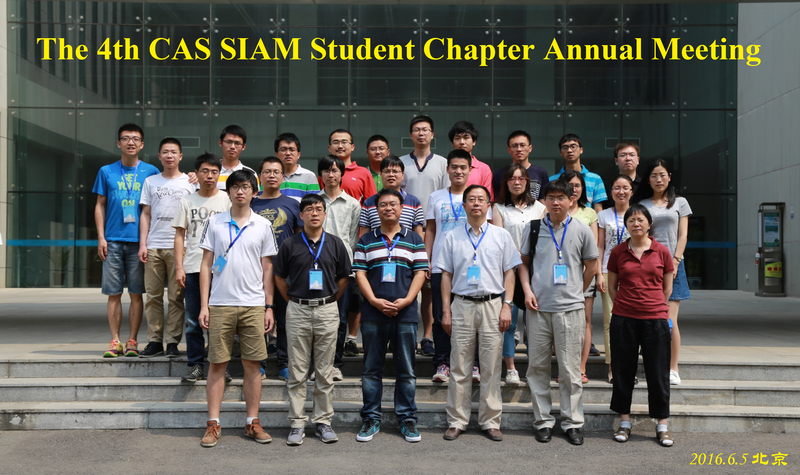 The 1st CAS SIAM Student Chapter Annual Meeting took place on Saturday, 25th May 2013 at Institute of Computational Mathematics and Scientific/Engineering Computing, Academy of Mathematics and Systems Science, Chinese Academy of Sciences, Beijing, China. The day consisted of an opening ceremony, two plenary talks and six student talks. We were very honored to invite Prof. Qun Lin (AMSS, CAS) and Prof. Yu-Hong Dai (AMSS, CAS) as our distinguished guests to address the opening ceremony, and Prof. Wuming Liu (Institute of Physics, CAS) and Dr. Xin Liu (AMSS, CAS) to give the plenary talks. we also had international speaker and speaker form industrial community. 45 students from 7 institutions participated in our annual meeting. 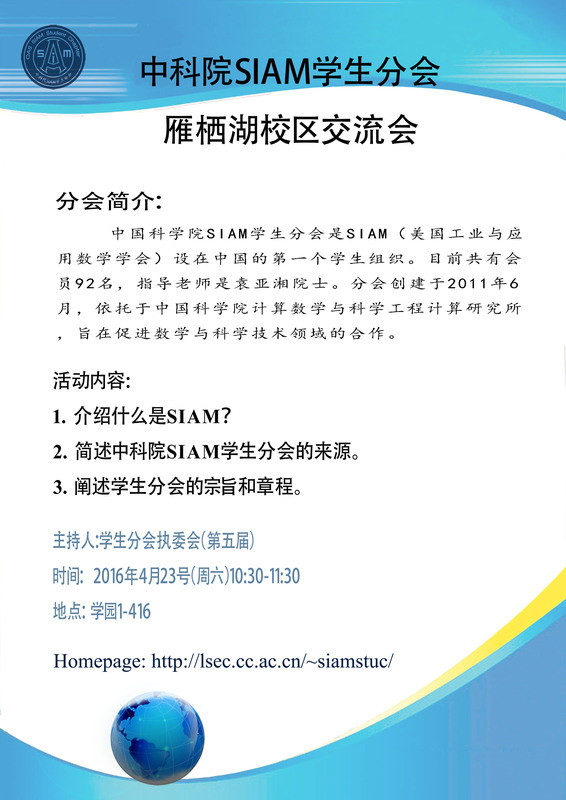 The 1st CAS SIAM Student Chapter Annual Meeting was sponsored by Institute of Computational Mathematics and Scientific/Engineering Computing (ICMSEC) and Society of Industrial and Applied Mathematics (SIAM). For more information, please visit the homepage of the annual meeting. 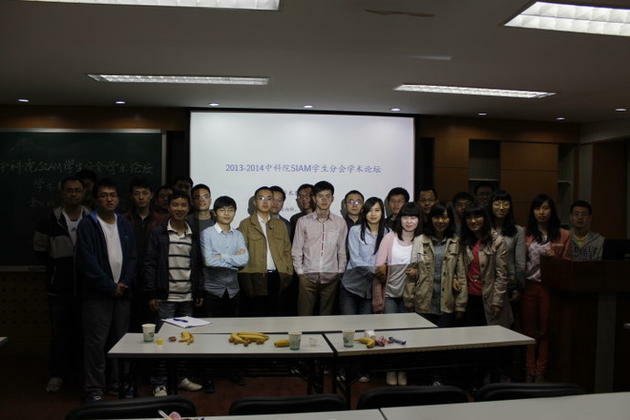 Seminar on "Three dimensional electromagnetic problems in large power transformers"
On April 26, 2013, we invited Xue JIANG from AMSS, Chinese Academy of Sciences to give us a talk about "Three dimensional electromagnetic problems in large power transformers". 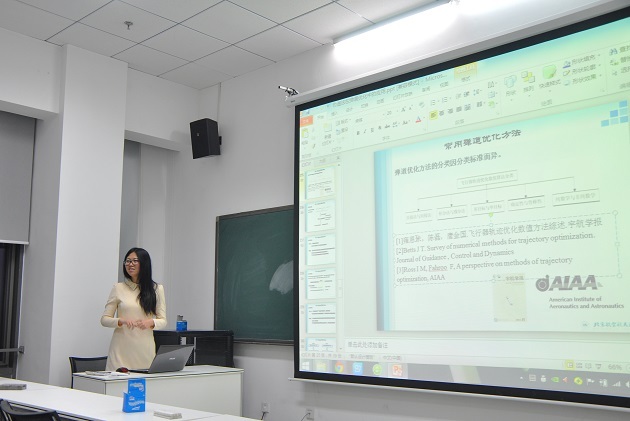 She talked about her recent work on three dimensional electromagnetic problems. 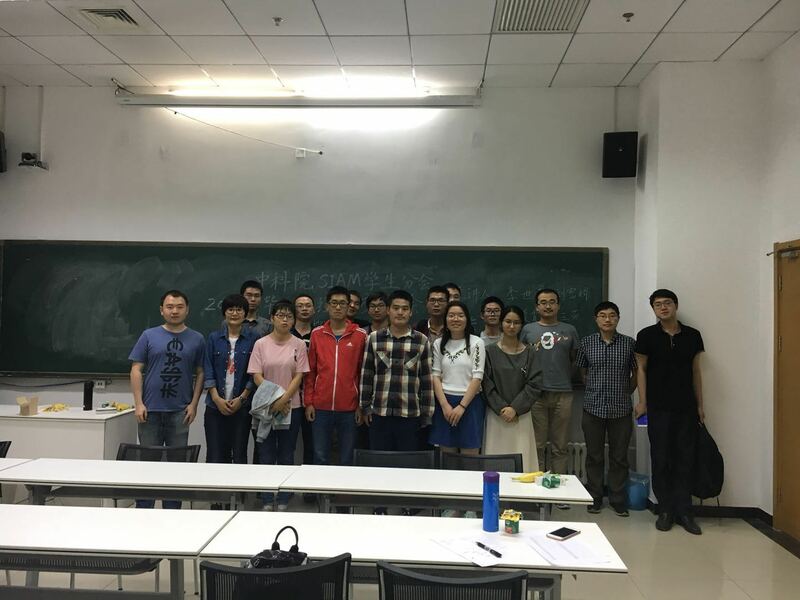 She and her cooperators proposed efficient mathematic models for solving TEAM benchmark problem 21, established the well-posedness of the new models, and developed the parallel adaptive finite element programming for the numerical simulation of large power transformers. Many students of our chapter participated in this seminar, and they had hot discussions after her talk. Our chapter held the first seminar during 19:00-21:00 on March 25, 2013. 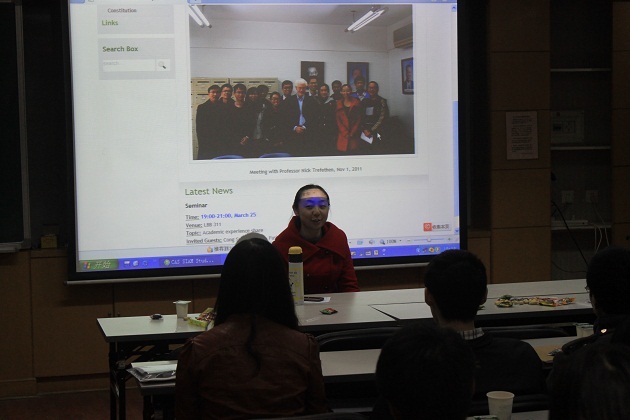 Four guests, namely, Cong Sun, Bo Jiang, Fusheng Luo and Dongsheng Xu were invited to gave talks about their own academic experiences. More than 34 members participated in this activity. Cong Sun talked about her one-year experience in Germany. She highlighted three points. Firstly, there is no short cut in study other than endeavor. Outstanding work with no doubt comes from hard-working. Secondly, all work and no play makes Jack a dull boy. During her study in Germany, she had not only finished four excellent papers, but also traveled more than 6 countries and really enjoyed a pleasant time. Thirdly, schedule the research. Whenever something is going to be done, make a plan, enforce a deadline, and write reports periodically. Bo Jiang was the former vice president of the chapter. He talked about the history of our chapter. Our chapter would not had been founded without the kind guidance of Professor Lloyd Nick Trefethen FRS (SIAM President of 2011--2012), Professor Ya-xiang Yuan (our Faculty Adviser). Besides, hard work had to be paid to make our chapter formal, which owed to the former officers, especially Zaikun Zhang, who is the founding president of the chapter. Finally, he suggested us to strive to our work, to build up our body and to be passionate every day. Fusheng Luo was the former treasure of the chapter. He shared his experience of job hunting. Generally, for masters, one can find a position in financial industry, technology companies, high schools or just continue studying abroad. For doctors, most likely they will apply for a job in universities, research institutes, as well as technology companies. However, before hunting a job one should develop some skills, such as programming and researching. The more you prepare, the better job you will find. Dongsheng Xu was the former secretary of the chapter. He advised us to be confident, to keep a peaceful mind and to devote ourselves to work. He also took the example of Ang Lee to encourage us to persist. The participants and speakers had a relaxed and delightful communication then. We really had a good time together. The chapter officers and some other student members had a meeting with SIAM President -- Professor Nick Trefethen FRS on November 1, 2011. He inquired our current development attentively, and expressed deep concern over the future plans of the newly founded chapter. He highly appreicated the work we have done and encouraged us to work hard to builp up a fantastic student chapter. Finally, he took a photo with us and left us some words as below. What an extradinary thing to be the first visitor to the first SIAM student chapter in all of China! That is truly momentous, and I hope we can look back on this day very happily in years ahead.